We’re never sure why people are so averse to comparing apples and oranges. They’re both fruit, after all. It’s not like comparing ox heart and communism. Like apples and oranges, Brendon McCullum and Angelo Mathews are quite different, but also have rather a lot in common. There were plenty of other contenders this year. Kumar Sangakkara couldn’t stop scoring runs and Steve Smith developed a real taste for the Indian bowling, while last year’s Lord Megachief of Gold, Dale Steyn, has become so relentlessly brilliant that people don’t even bat an eyelid when he takes 39 Test wickets at 19.56. However, Brendon McCullum and Angelo Mathews have been the players who have stood out for us. We have spent the last week or so trying to choose, but their cases are so different that it has been like comparing crisps with ennui. In the end, we decided that as captains of lower profile Test nations who have led by freakish example, they both have an equal claim to the title, even if they have reached this point via entirely different routes. We’ll start with McCullum because his case is more obvious. Until recently, he has always been far better in one-dayers than Tests, but in 2014, he averaged 20.33 in one-dayers and 72.75 in Tests. But even that doesn’t really give the full story because between the middle of February and the end of November, he didn’t get past 50 in the longest format. 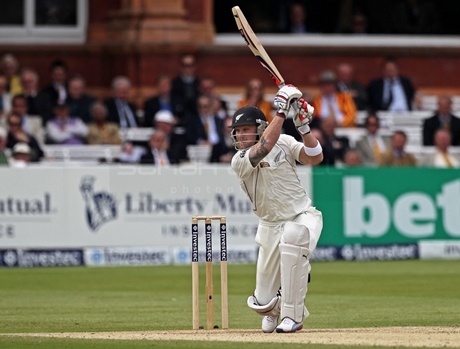 Truth be told, McCullum didn’t register a single Test fifty all year. He was only an ounce of extra heft away from not having made a score between 100 and 200 either. His 134-ball 195 against Sri Lanka on Boxing Day seemed an almost childishly needless means of pointing out to everyone that he could also score normal hundreds as well as doubles and triples. New Zealand won that match – their last of the year – just as they’d won against India in their first match of the year when McCullum had made 224. One match later, he made 302 after his side had surrendered a 246-run first innings lead to earn an unlikely draw. You can’t say he doesn’t influence matches and nor can you say that he doesn’t make the most of good form. McCullum’s crowning achievement came in November, however. Australia had just demonstrated how hard it is to even compete against Pakistan in the UAE, let alone win, and the ‘home’ team had at first carried on in much the same vein against New Zealand. But a Kiwi side hewn in McCullum’s stumpy-but-still-up-for-a-fight image was having none of it. They drew the second Test and then minced Pakistan in the third. Mark Craig was man of the match, but McCullum made 202 off 188 balls. It’s hard to respond to something like that and Pakistan couldn’t. 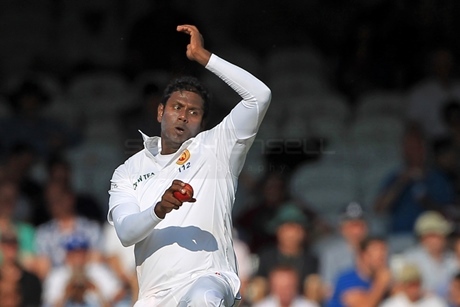 Angelo Mathews has been harder to spot. Not for him the double hundreds. In fact, even the single hundreds feel like aberrations. Mathews’ year has been almost the exact opposite of McCullum’s. He seems to have made 50 almost every time he has gone out to bat. Only once in 20 Test innings was he dismissed for a single-figure score and despite only two hundreds, he averaged 77.33. If this is starting to sound like a celebration of mediocrity, factor in his one-day knocks and you start to get a feel for the scale of his achievement. Over 31 50-over innings, he averaged 62.20 and even when his team was rubbish, he was good. In five sad defeats to India, he delivered 92 not out after arriving with the score reading 64-3, 75 after arriving at 42-3 and 139 not out after arriving at 73-3. Quite simply, he never lets his side down. At times in the past, he’s seemed a trifle bits and pieces. But nowadays his bits of bowling arrive alongside some magnificent pieces of batting. His all-round performance at Headingley must rank somewhere reasonably high in some list or other of good cricket things. We’re not going to define that list or choose the ranking because that could only elicit nit-picking which is surely besides the point. Mathews had taken 4-44 in England’s first innings when he walked out to bat. His side were 68 ahead with four wickets down and had just expended an extraordinary amount of energy in securing a nine-wickets-down draw in the first Test (a match in which he had made 102). Pretty soon, Sri Lanka were seven down and just 169 ahead. Surely the reservoirs of self-belief were running dry? At the time, we wrote about how batting with the tail is an amorphous puzzle where your goal oscillates between singles and boundaries with the field waxing and waning constantly. In short, it’s mentally exhausting, yet Angelo Mathews took his side from 277-7 to 437-9. Even then, he wasn’t done. England fought back through Moeen Ali. When you’ve poured so much into a game and it seems it’s still not enough, you can crumple or you can redouble your efforts. Quite how you accomplish the latter is beyond us, but that is presumably what Mathews managed in captaining Sri Lanka to their first proper series victory in England. Between them, they’ve got it all covered. Take a bow, Brendon McCullum and Angelo Mathews – the sides you captain are better for your presence. You are 2014’s Conjoined Lord Megachiefs of Gold. The first awards for both a Sri Lankan and a Kiwi. Out of the Big Eight (also known as the Big Seven plus the Windies), only Pakistan have yet to claim a Megachief of Gold among their own. Both thoroughly deserved, mind you (I’d forgotten about Mathews’ rearguard action, possibly on purpose). I’m a little surprised not to see Big Davey Warner among the honourable mentions, but that aside, all bases (stumps?) covered and covered well. On a completely different note, I feel that Walkers Ready Salted and ennui are pretty comparable. Surely you mean Walkers’ Cheese and Onion? Ready Salted would be more equivalent to stoicism. McCoys Flame Grilled Steak would be frugal-yet-decadent celebration, and Seabrook’s Sea Salt and Vinegar would be quiet contentment. I’m predicting a three-way tie for LMoG next year between Luke Fletcher, Rikki Clarke and Alex Gidman. I read recently that it is not uncommon for nominal twins to become intermingled at a very early stage in embryo development, resulting in what is termed a chimera. Most people in this state would have no idea, but it might be that they are male all over but have a female liver, for example. This is what I thought you meant by your headline. The arms of McCullum with the brain of Matthews, say. I thought you’d gone off on some flight of fancy wherein chimeric cricketers can be created at will. I was going to suggest you could have added the spleen and bile of Ricky Ponting, maybe also the tear ducts of Kim Hughes, or the gall of Alastair Cook. But that isn’t what you meant so I won’t. The reflexes of Chris Jordan, batting stance of Shiv Chanderpaul, that sort of thing? The sad news is that the only recipient of Grand Lord Megachief of Gold, Shiv Chanderpaul, seems to be struggling in South Africa at the moment. I just kind of assumed that he would still be there scoring large not out scores in big West Indies losses for all eternity, but maybe old father time is finally catching up with him. Just watched B McCullum get the key to the city of wellington. Not quite a pretigious as this award I would imagine. And then drunk on the adulation gets a 2 ball duck. Sorry for the amount of cricket in this report. I have hot chocolate and doing the crossword. Crisp humour on both this sub-thread and one above – for very different reasons. We had Lords Mega Joint-Chiefs of Gold in an earlier draft. Perhaps we should have a Lord’s Megachief of Gold each year, to celebrate the person who performed best at the home of cricket. An ox heart sounds stout and proletarian, so it’s not quite as grotesque as imagining Mathews and McCullum–conjoined–lurching down the pitch, an inarticulate wail escaping one of their common orifices. Starting the lobbying for the 2015 award already, Sam? Get the early salvos in first, quite right. Interested to know what you fine people think of the Sangakarra vs Tendulkar argument that is currently lighting up the comments sections of Cricinfo? As a Lara leaning man when talking about the best player of the last 20 years over Sachin, great though he is, i was astonished to see Sanga’s average being virtually 59 today and it made me think…So naturally i turned to the place with the finest cricket brains in the world to ask the question. I’d pick Sanga. If for nothing else, because it’d annoy the Cricinfo commentators. Personally, I think it is an astonishing insult by KC to not give Tendulkar the LMCoG this year. What more does Sanga need to do?! Hopefully he’ll extend his Test career to the end of this year, and finish it with a handy World Cup winner’s medal plus a Test average up there in the 70s.